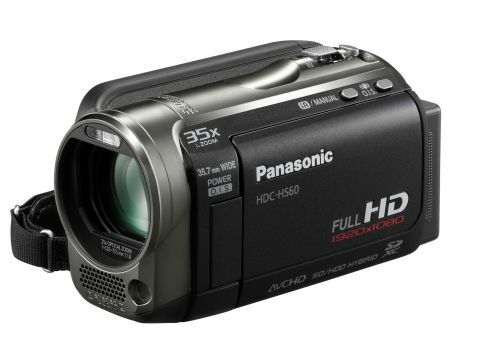 The Panasonic HDC-HS60 is a brand new full HD camcorder which packs internal storage galore as well as many other nifty features. However, when less than £200 gets you a pocket-sized, YouTube-friendly movie camera like the Flip or even Apple's iPod nano, why would you want to spend over £500 on a camcorder – even one as crafty and compact as Panasonic's HDC-HS60? The crux of the problem is that as established camcorder manufacturers make their conventional models smaller – though still rammed with features – they're asking buyers to make a decision on products that while not much bigger than pocket-shooters can often be more than twice the price. Entering this fray is the HS60, a spec'd-up, Full HD (1,920x1,080) camcorder, which doles out the type of modes a Toshiba Camileo or Samsung HMX-U10 can only dream of, and which forms part of a three-pronged '60' series that includes the TM60 and SD60. Movie clips are recorded, using the AVCHD format, to an impressive 120GB HDD. With four recording settings this means there's the potential to record between 15 and 51 hours of video. And the inclusion of an SD card slot increases this storage, as if you fill the hard drive the cam will automatically continue recording to any installed SD card. The HS60 is the successor to last year's HDC-HS20 and Panasonic has grabbed the opportunity to upgrade some elements. Chief among them is the ability to use SDXC, the latest version of SD card-recording technology. SDXC promises faster access and more reliability, as well as the increased capacity of 48GB and 64GB cards. An already advanced optical image stabilisation system receives the boost of Power OIS with Active mode, and this eliminates low-frequency hand shake. There are also additions including a wind cut feature to further reduce interference on the microphone and a 25x optical zoom.